Portugal established a trading empire in Asia in the 16th century by means of a string of important ports that tapped the products of the continent. Macao (Macau) was Portugal’s outpost on the South China coast. Vasco da Gama was a Portuguese explorer and the first European to reach India via Africa. He was followed by Afonso de Albuquerque (1435–1515), viceroy of Portuguese India, who arrived in Goa on the western coast of India. In 1410, he sent a fleet to capture Malacca on the Malay Peninsula. There they found many Chinese sailing vessels trading in silks and other products throughout Southeast Asia. In 1517, Portugal’s envoy Tomé Pires arrived in Guangzhou (Canton) on the Pearl River delta, an important trading port for two thousand years. The eight Portuguese ships fired cannon shots as a salute upon entering the harbor, a ritual that the Chinese misunderstood. Pires however remained in China, attempting to negotiate with the government of the Ming dynasty (1368–1644). The Chinese held him responsible for the misdeeds of Portuguese sailors and he died in a Chinese jail in 1524. Despite this inauspicious beginning, the Portuguese continued to explore trading opportunities along the Chinese coast and finally were permitted to build an outpost at the end of a peninsula on the southwestern end of the Pearl River estuary in 1535, a two-square-mile land with a good harbor called Macao. 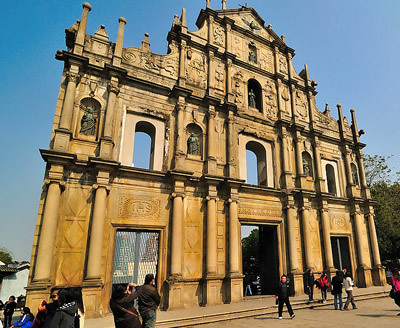 The Portuguese paid rent to China for Macao and in return were allowed to build docks, trading facilities, a church, schools, and so on, and to govern themselves. Even when other European nations were allowed to establish trading companies in Guangzhou, they had to leave their “factories” (offices and warehouses) along the waterfront outside that city when the trading season was over and retreat to Macao. In addition, Macao became the base for Jesuit missionaries coming to China. Jesuit missionaries were honored and their services in fields such as astronomy, cartography, architecture, and weaponry were valued by the Ming, and later the Qing (Ch’ing [1644–1911]) court. Several Jesuit fathers designed and supervised the making of European style weapons such as cannon pieces in Macao for the Ming government up to 1644 and the Qing after that. The arrival of the Portuguese in China in the early 16th century opened a new chapter in China’s relations with the outside world. Sino-Western relations would be fundamentally different from China’s interactions with its land neighbors and with earlier Persian, Arab, and Malay maritime traders in eras past.